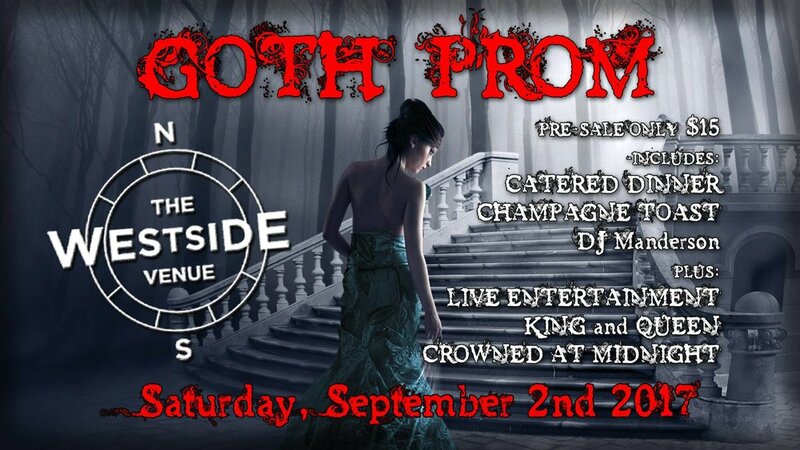 Goth Prom 2017 at The Westside Venue !!! Tickets include a full dinner catered by a touch of class catering! Plus a glass of bubbly to toast to your crowned king and queen of the shadows! Live music by some awesome local metal artists and much more! Grab a date, dress for the darkness and head on out! DJ Manderson will be spinning heavy dance tunes all night long! Requests are accepted! A glass of champagne is included but all other alcoholic beverages will be available at the bar. Cash and credit are accepted! $15 Pre-Sale Tickets will be available August 17th. Please follow this page for the details! Tickets are bumped to $20 a piece at the door so make sure you pre-order!